ARTIST K8 HARDY IN ATTENDANCE. “In 2001, I set out on the structuralist journey that has become my first feature film, Outfitumentary. I named the project at the outset, and considered it a document for posterity, an important record of the dress codes of a radical lesbian underground. The formal rules I imposed were simple: to roll my video camera and capture a shot of myself from head to toe with a turn to provide front and back. Ultimately, I played fast and loose with my own rules, but stayed true to my original intentions” (© K8 Hardy, NY, 2016). K8 Hardy (b. 1977, Fort Worth, Texas) is an artist and filmmaker based in New York. 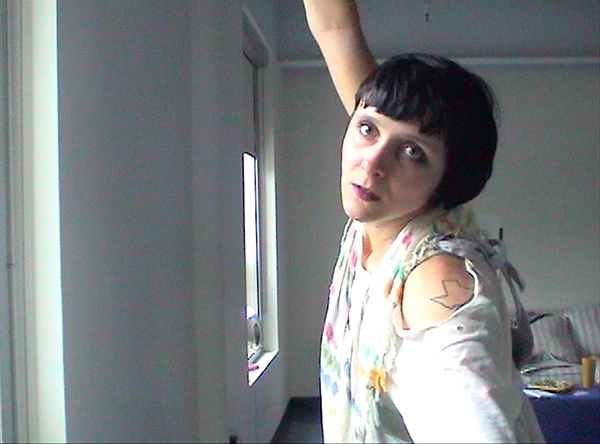 Her performances, photographs, self-distributed zines, videos (including music videos for Le Tigre, Lesbians on Ecstasy and Men) and films have been exhibited at venues including the Whitney Museum of American Art/Whitney Biennial 2012; MoMA PS1, NY; Dallas Contemporary, Dallas, Texas; The Tate Modern, London; Reena Spaulings Fine Art, NYC; Künstlerhaus, Halle für Kunst und Medien in Graz, Austria. Outfitumentary is her first feature film. Presented in collaboration with the Contemporary Art Society Vancouver, Emily Carr University of Art + Design, Cineworks, and Queer Arts Festival. K8 will speak about the film at an event the following evening, 26 January, starting at 7 PM at ECUAD.